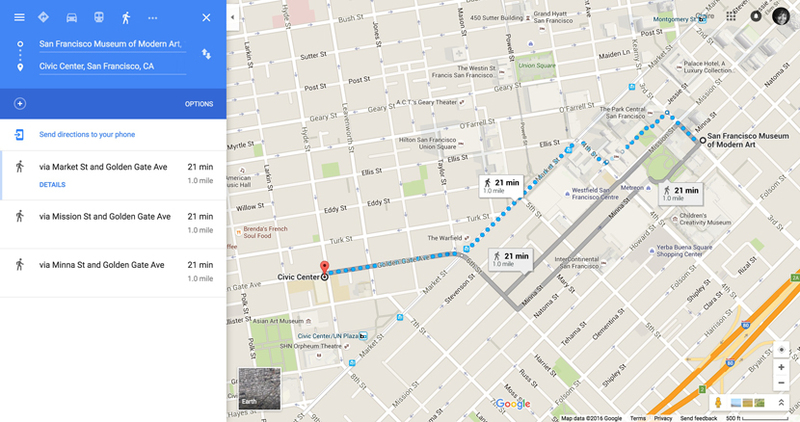 You may have heard that SFMOMA is reopening. In anticipation of this fast-approaching reality, Open Space has commissioned “Disembodied States” — a special nine-part Collection Rotation from artists, writers, and thinkers outside of California — as a celebration of the breadth and reach of the collection, and a nod to these last moments in which the museum exists as a hypothetical space, a space that can best be accessed through the virtual, and the imagination. We see these pieces as stand-alone works-of-art, rendered in a variety of media, and jostling in a larger, strange conversation with the collection. Welcome — please come in. 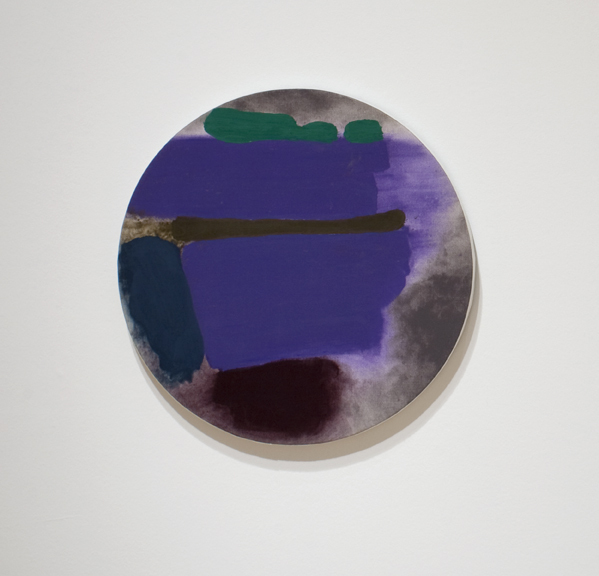 One single-word title for two purple-hued paintings, both abstract: Procession, a tondo by Friedel Dzubas from 1971, and Procession, a vertical canvas by Caroline Kent from 2015. About the former, acquired by SFMOMA in 1978, I know little other than the title, which I found through a keyword search in the museum’s ArtScope digital archive. Movement is suggested in the contrast between the rotund shape of the canvas — most common in Renaissance-era European art — and the bold, horizontal brushstrokes, set amid cloud-like grays and hazily contoured dark-colored patches. Motion, transfer, and order: much like painting might appear a counterintuitive choice of medium to project the notion of procession, procession itself might seem antithetical to a display apparatus within the museum. Not so in the Snøhetta-era SFMOMA, which offers the possibility of enhanced circulation within the museum’s old and new indoor and outdoor spaces and more points of access from street to gallery. Installed back-to-back at the entrance of the new sixth floor painting and sculpture galleries, the Procession paintings form a static marker within the visitor’s processional motion through the museum and a discreet introduction to Midtopic Mysteries: An Ambulatory Museum Theory. A virtual exhibition of works from within and without SFMOMA’s collection, as well as inside and outside the physical premise of its imagined incarnation, Midtopic Mysteries seeks to experiment with the exhibitionary complexes and cultural complexities afforded by the museum’s expansion. Midtopic Mysteries presents artistic practices that manifest as performance and immerse the viewer/participant — and oftentimes the artists themselves — into the ideological limbo between utopia and dystopia that art historian Ellen C. Caldwell termed midtopia. 3 It also outlines a theory of and curatorial methodology for processional performance, set against a brief historicization of the practice from European medieval mystères to contemporary Caribbean carnivals. Finally, it hints at the return of the body-in-motion from screen to stage to street, following its late nineteenth-century transference from street and stage to screen after the invention of the cinematograph — and elicits why the millenary display mode of the processional matters anew today. Finally, Midtopic Mysteries approaches theory in its double meaning as procession (a theory of figures in a Greek frieze) and theory (a system of ideas), thus blending theory and practice. On the seventh floor of the Snøhetta expansion, the terrace provides views of an outdoor space within the museum and, to the northeast along Howard Street, the outdoors beyond the museum. 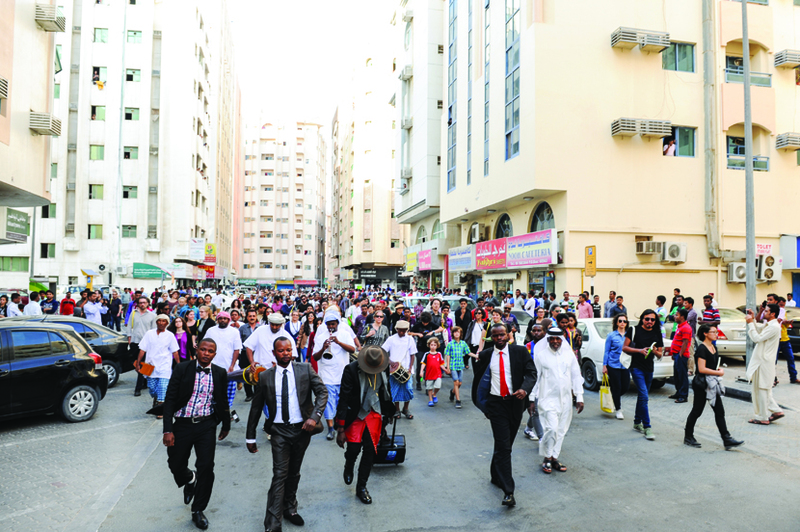 Brass band musicians from Papy Ebotani’s Fanfare funérailles respond to one another two floors apart, rallying museum crowds in their wake as they proceed to the museum’s lower levels. Meanwhile, two films are screened, one in each of the new media arts galleries that bookend the open-space contemporary galleries, framing one of the museum’s most dynamic contemporary art spaces. Cauleen Smith’s H-E-L-L-O (Infra-Sound/Structure), shot in New Orleans in 2014, applies processional motion to the camera itself, rather than to the brass band musicians it records sitting or standing still at memorial spaces throughout the city. William Cordova’s Silent Parade…or The Soul Rebels Band vs. Robert E. Lee, likewise recorded in New Orleans in 2014, opposes a well-known marching band to the statue of the forever out-of-step Confederate general. Standing on the rooftop of a building across the street from Lee’s statue, this flying call-and-response figure offers a pendant to Ebotani’s own multilevel performance. My critique is substantiated by the recent development of processional performance modes in artistic practices: Francis Alÿs’s The Modern Procession (2002) and Simon Fujiwara’s New Pompidou (2014) bookend a much longer list of contemporary processional performances created by artists the world over during the last decade. I draw attention to these two works because of the relationship they establish between wandering works of art and the museum (the Museum of Modern Art in New York and the Centre Pompidou in Paris, respectively) within a Western contemporary art context. 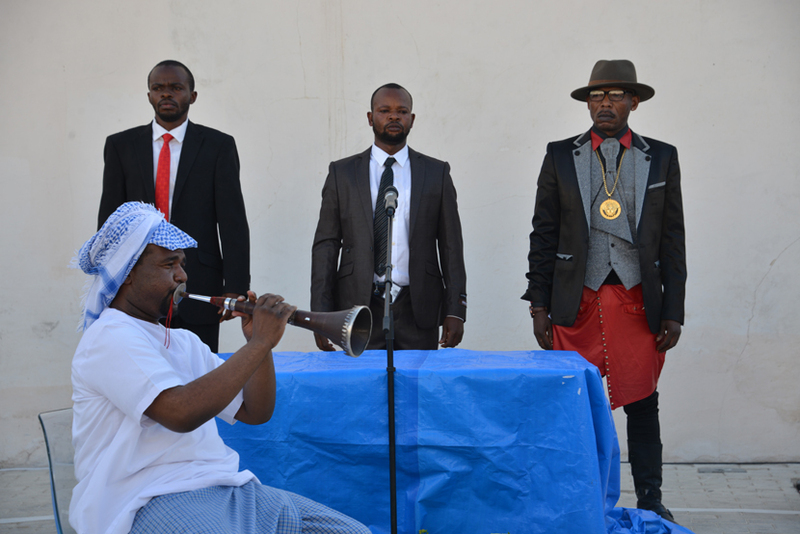 Another genealogical processional performance path, independent of a relationship to the museum, could be followed with Meschac Gaba’s Défilé de perruques (2006, 2008, 2010, 2012, various locations) and Ebotani’s Fanfare funérailles (2014, various locations) as African cultural coordinates. Imagine Ebotani’s work winding down from the seventh floor terrace, through the fifth floor sculpture garden, the second floor hall, and out onto the streets through the atrium. SFMOMA’s indoor and outdoor spaces become the liminal points of junction with the physical boundaries beyond the institution itself. Having rallied museum visitors on every floor along the way and created an expectant audience on Howard Street, Ebotani’s processional divides, exiting the building from the Helen and Charles Schwab Hall and the Evelyn and Walter Haas, Jr. Atrium and rejoining at the confluence of Howard and Third Streets. Proceeding east on Howard Street toward the Embarcadero’s promenade, the processional ends at the ocean. The music of the brass band evaporates in a distant echo to its New Orleans parent sound, which continues to play in a loop in the media arts galleries back at the museum. 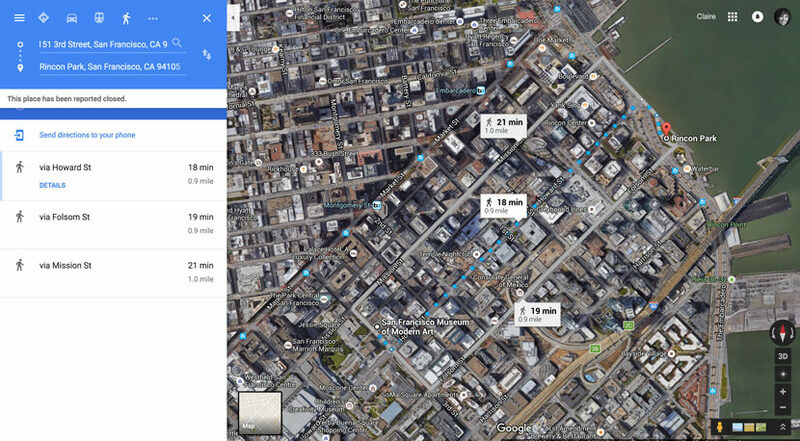 Itinerary 2 (for Korakrit Arunanondchai): SFMOMA to Market Street, going east. Korakrit Arunanondchai and his posse, as well as the trio formed by brothers Ramin and Rokni Haerizadeh and friend Hesam Rahmanian, take opposite paths to and from the White Box, where they are scheduled a couple of weeks apart from each other; one Saturday night a month finds a rotating cast of characters using the full clubbing capabilities of a white cube gone black box. Arunanondchai will present a sprawling installation in the vein of Painting with history in a room full of people with funny names 3 (2015) at Palais de Tokyo, scaled to the size of the White Box — the starting point to a no-less-sprawling processional action that will unfold outside the museum, all the way to Market Street, following the popular itinerary of the SF Pride Parade. In both Painting with history and Letters to Chantri #1: The lady at the door/The gift that keeps on giving (feat. 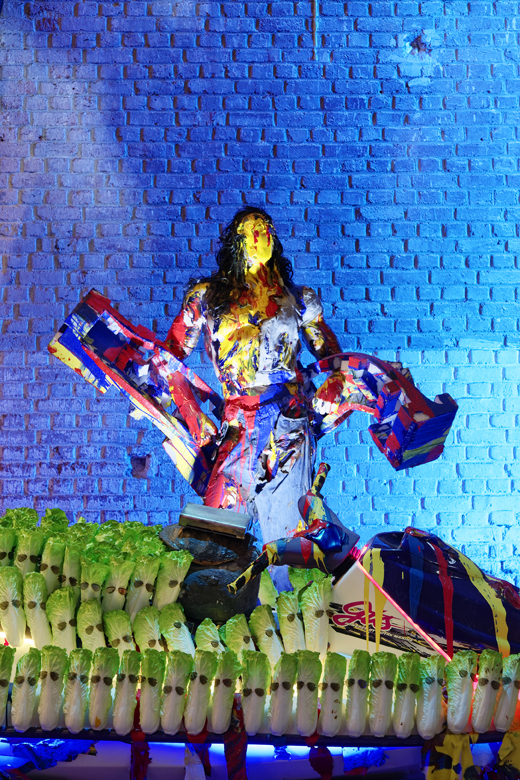 boychild) (2014), Arunanondchai displays his witty repossession of a sensorial world steeped in contrasting aspects of contemporary Thai culture, from colorful rituals associated with old traditions to gatherings of youths in white shirts and blue jeans demonstrating millennial angst. 5 Might the combination of these two processional motions yield to new performance practices out in the open? 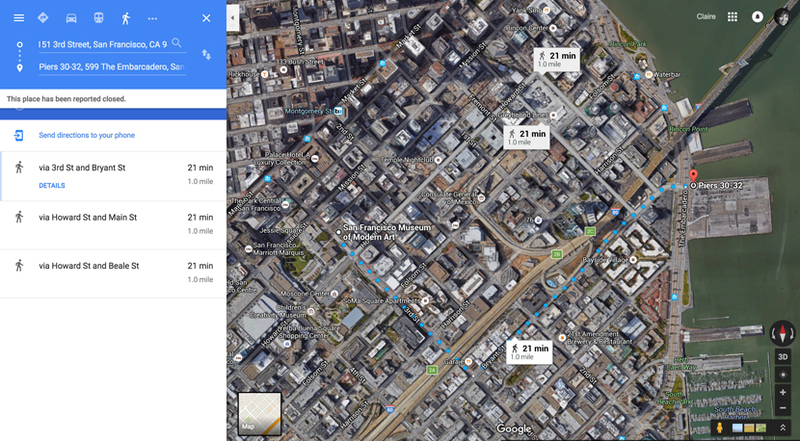 I envision the exit out of the White Box through the elevators right outdoors, down to the Education Center and onto Minna Street as well as by foot from the stairs around the oculus, into the atrium and out to Third Street and northwest onto Market Street, going east. Owing to the video documentation of the Haerizadehs and Rahmanian trio’s The Birthday Party performance on the deck of the Institute of Contemporary Art, Boston (2015), I locate the start of a three-person processional performance in Rincon Park, near the Embarcadero coastal road. How long would it take this human wagon (of sorts), clutching a crutch as if in a slow relay race in which the baton is never passed, to return to the White Box? The outdoors actions of the trio might be more at ease in stop-action video animations like Rokni Haerizadeh’s Letter! (2014) or his work on paper La Rue, 9029 (2012), in which rumors of Iranian uprisings collide with Dadaist gestures. Processional motion might be more meaningful as a meandering through the inner streets of the museum spaces between and within galleries, from floor to floor, out onto terraces and cafes (gathering romaine lettuce to refresh their precarious headpieces and Arunanondchai’s installations with which they share this uncanny material). Be it as a starting or ending point, the White Box adapts to live performance, film screenings, and installations, living up to the promise of its punning title on the white cube (or gallery space), and the black box (or post-proscenium stage), as archetypal display apparatuses for the Western cultural icons of the museum and the theater. Whether or not the White Box provides a station as part of an artists’ and visitors’ processional performances and motions, it signals the consummate embeddedness of performance in museums. A canvas-size carpet raised slightly above ground welcomes visitors. 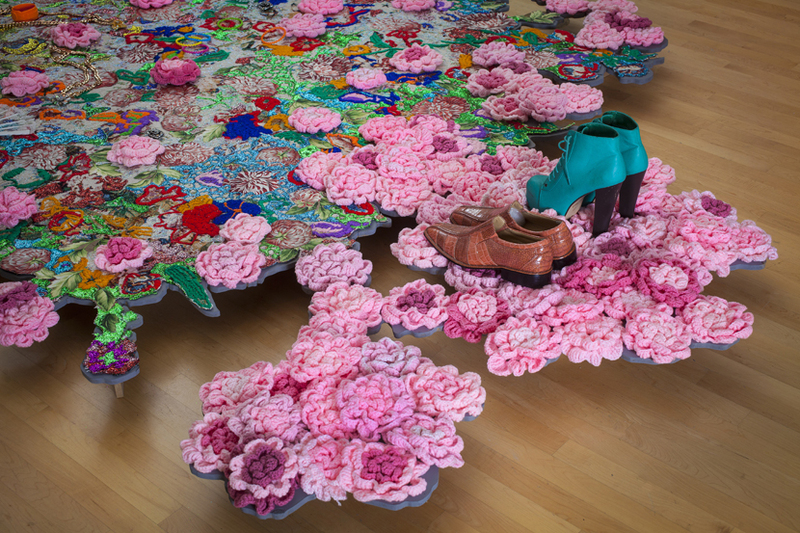 Men’s shoes in faux-reptile skin and women’s purple platform shoes lie atop pink crocheted flowers, forming an unordinary mat at the bottom of a larger rectangular fabric assemblage. 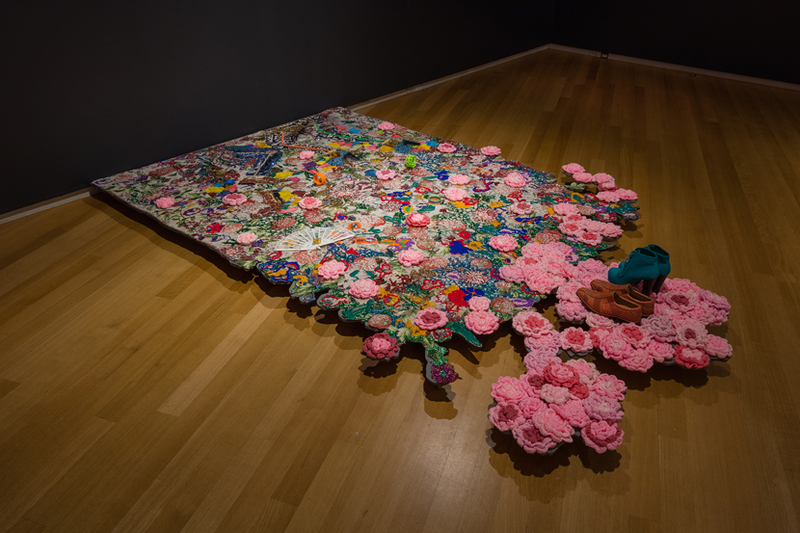 Though the ensemble resembles a carpet, its shape and materials confer upon Ebony G. Patterson’s where we found them (2014) the ambiguous status of a fallen picture — fallen like the bodies of the couple whose beaded and embroidered legs hover in the upper part of the piece. One of the Dead Treez series, where we found them furthers Patterson’s ongoing commemorative project: celebrating the lost lives of Jamaica’s underground dabblers, dancehall pioneers, and class warriors in variants of the “bling” style, through which they claim visibility in life and the hereafter. where we found them invites multilayered reflections on liminality: the carpet where shoes are removed, the threshold one cannot cross, the lives that are lost. It is intended to give visitors pause. Contemplative where Invisible Presence: Bling Memories (2014) is participative, where we found them provides the background against which to comprehend the Caribbean cultural ramifications of recent contemporary performance — the modern ramifications of the European and African journeys to the Americas alluded to earlier. Stemming from Carnival and other Caribbean festivals, stepping into marches and tours (Charles Campbell), and parades and processions (Marlon Griffith, Hew Locke), these performances invite the participation of the multitude. 6 By bridging the divide between street and museum, conceiving of contemplative objects and participatory performances that can move between these spaces, Patterson completes the leg of the journey of an exhibitionary complex gone global — to and fro, within and without, besides and beyond the museum. More fundamentally, Patterson’s emerging Carnival-inflected mass street performances might best embody a sense of a typically American midtopic modernity — with “American” understood as referring to the entirety of the Americas rather than North America alone. For hers was a genealogical journey onboard a ship different from the Ship of Fools, with cargos not of mad but of enslaved men — farther than European canals and rivers, out in the open of the Atlantic Ocean. 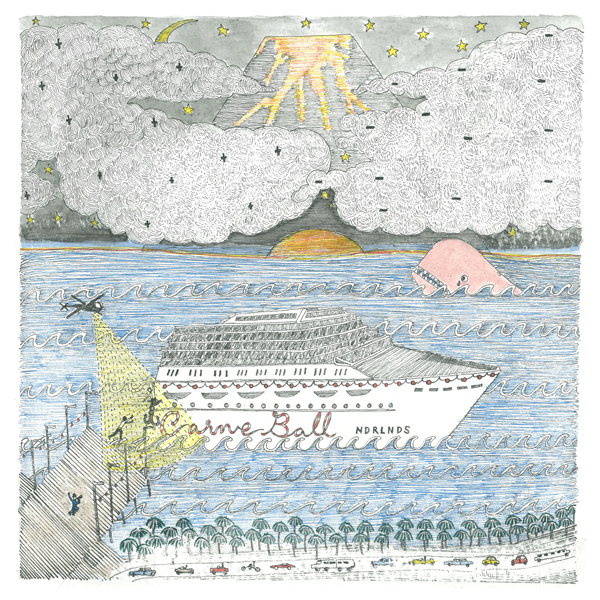 The contemporary carnival, on the other hand, might be more like the Carne Ball grand nave adorning the cover of Saturday Night (2010). Hailing from the NDRLNDS, a country that sounds as joyless as it is vowel-less, this carnevale was summoned up by the dangerously pan-American imaginary of Frohawk Two Feathers (born Umar Rashid), for whose work the word midtopic was coined in the first place. An artist whose practice oscillates between the depiction of neo-historical anti-colonial fantasies in multifarious works on paper, leather, and canvas and the performance of an alternatively New Wave and alternatively retro–hip hop sensibility via many collaborative musical outfits, Rashid has a sense for masquerade. 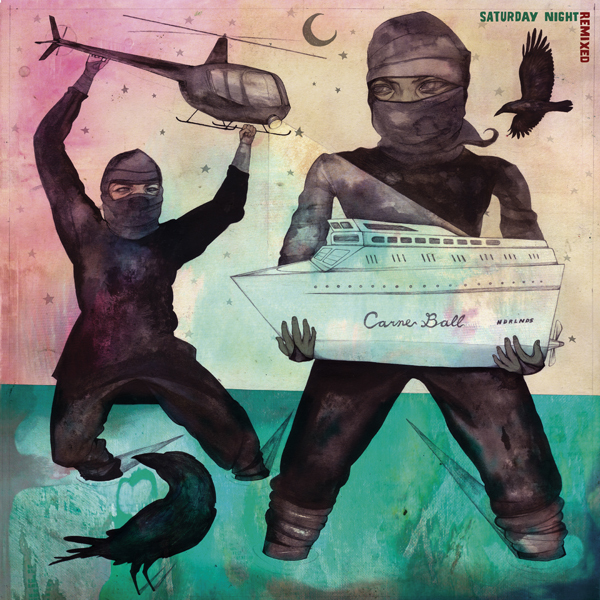 In Saturday Night, Carne Ball sails past two figures in distress it fails to rescue; in Saturday Night Remixed (designed by Silas Schletterer, 2012) the ship is held up by one of two turbaned figures who might well be seeking revenge for being previously passed by. While Fanfare funérailles left the museum and where we found them stayed there, The Propeller Group’s processional performance will depart from Garfield Square — the assembly point for the Day of the Dead, whose itinerary it will follow en route to SFMOMA. The New Orleans–style brass band for a Vietnamese jazz funeral in the film The Living Need Light, The Dead Need Music (2014) provides the template for The Propeller Group’s presentation as part of Midtopic Mysteries. 7 Part documentary, part fiction, The Living Need Light… ferries the viewer through the intricate paths of African-American and Southeast Asian funeral traditions. Driven by the faint sound of real faux-sculpture instruments akin to those designed by Christopher Myers for the New Orleans presentation of the film, the San Francisco performance will tease out the connection with the American celebration of the Day of the Dead tradition, which stands as one of the finest examples of global acculturation. After arriving at SFMOMA and lingering around the Howard Street entrance, the lively mortuary commotion will settle in a gallery, finding a temporary resting place for the span of an exhibition. The Howard Street entrance (a longitudinal pedestrian path, museum-scale parade ground, and de facto outdoor public gallery that leads to a free-of-charge gallery on the first floor) provides just the kind of transitional space ideally suited for seamless motion in and out of the museum. Through changes of location and name, SFMOMA has stood at the crossroads of San Francisco’s civic, ritual, and festival heart, on the path to and in the way of its worker demonstrations, Pride parades, and carnivalesque processions. 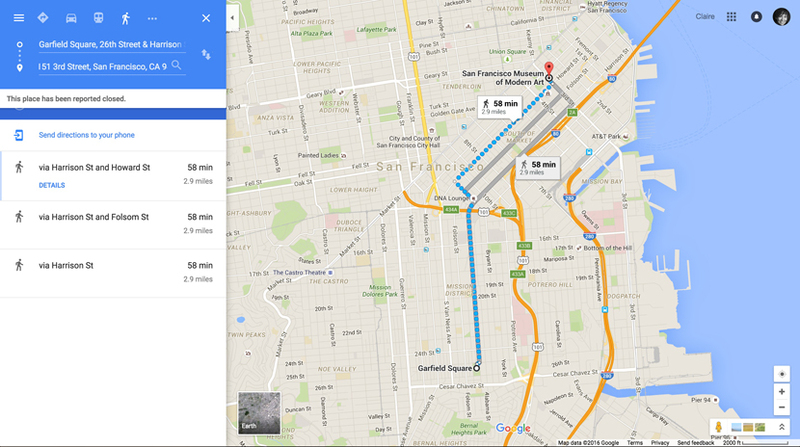 Having expanded into a block-wide arts complex through successive additions, SFMOMA now opens to three distinct streets (Minna, Third, and Howard; four if one counts Natoma) across a two-block-wide site. How might motion in and out of the museum be facilitated, what kind of navigation within and without the museum foreseen, what works guide these multiple motions along the way? In the longest and narrowest of these rooms, at the top of the wall-less space across the fourth to fifth floor ascending staircases, hangs Inauguration Parade, Washington, D.C., January 20, 1989 (1989); Thomas Frederick Arndt’s black and white photograph provides a conversation starter for Stephen G. Rhodes’s reinterpretation of Interregnum Restoration Repetition (Who Farted!!??!??!!!?!) (2008). 8 A messy presidential bureau bedecked by the starred and spangled banner and surrounded by detritus, the sprawling installation is filled with tripping hazards and video projections featuring past American presidents amid flying ballots and the artist himself (with a watermelon head). Eight years after its creation, and especially during an election year, Rhodes’s work resonates just as strongly as it did around the time of Barack Obama’s inauguration. Might setting into motion a second version of Interregnum provide the constantly changing (yet staunchly static) state of governmental politics with a provocative counterpart, one fashioned after a seasonal carnivalesque festival? 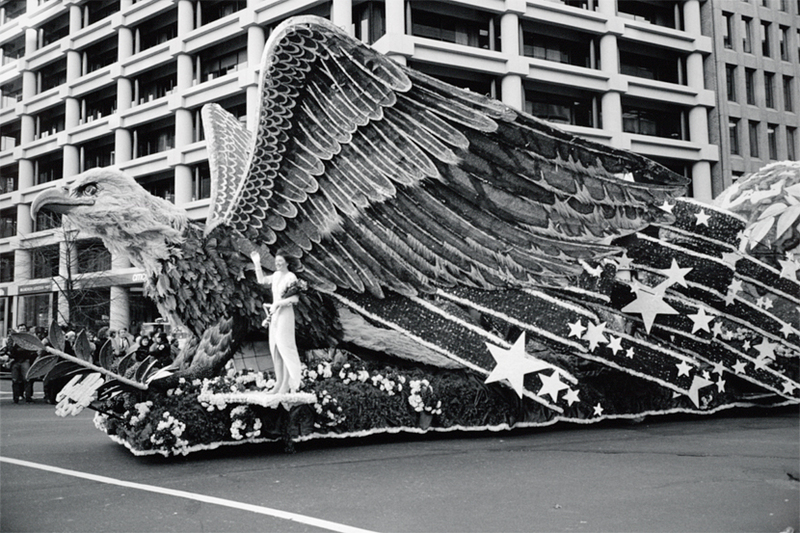 The parade float in Arndt’s photograph reveals its prefigurative role. Rhodes is a part-time New Orleans resident affiliated with some of the city’s parading ensembles and sensitive to the unapologetically politically incorrect aesthetics of one of the most famous of these groups (Krewe du Vieux). One can imagine him creating Interregnum II, a Mardi Gras–inspired processional performance update of the first. 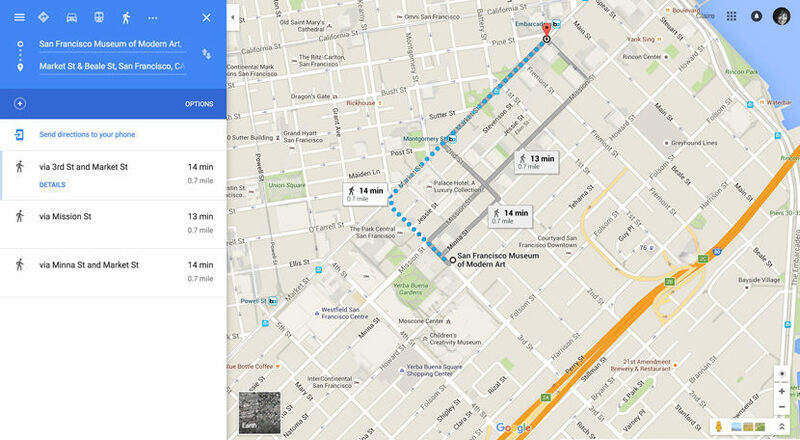 It would lead, appropriately, to the Civic Center, San Francisco’s primary protest site — and SFMOMA’s original location. 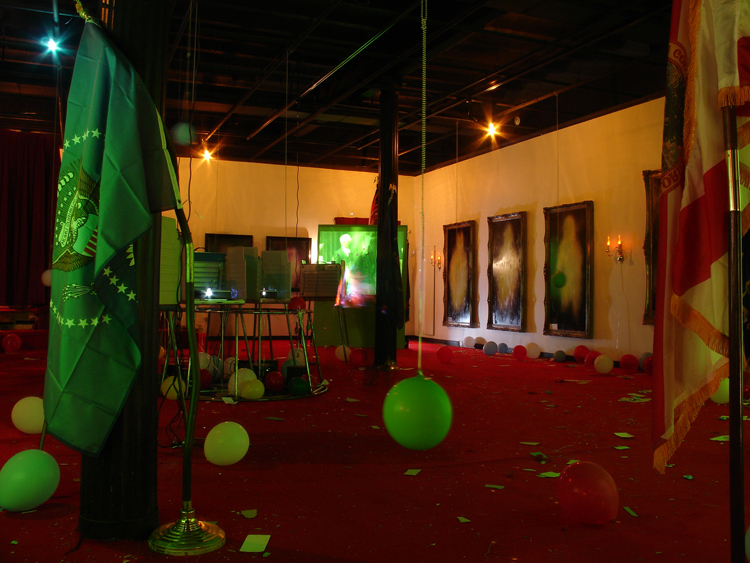 Would a theatrical installation of Der magische Krug (2013) prevent the very effects it seeks to impart? Replete with its own row of cinema seats, John Bock’s fifteen-minute expressionist-era silent film hybrid is as much a statement about display as it is a testament to its author’s genre-bending aesthetics. Shall Der magische Krug, a miniature black box of its own meant for display in a white cube gallery, be displayed in the White Box instead? Or could the jarring nature and somewhat tautological gesture of a black box theater within a black box theater engender just the kind of distorted experience to which Bock seeks to expose his audience? An outré drama revolving around a magical jug, in and out of which characters disappear and reappear under a different guise, Der magische Krug reserves its greatest trick for the near-end, when the film’s main character erupts out of the screen and onto the stage, only to split open and reveal a miniature figure of himself — another theater within the theater, a theater of the self within the self. What are the implications of setting a theater within a theater in a matryoshka-like (dis-)play? 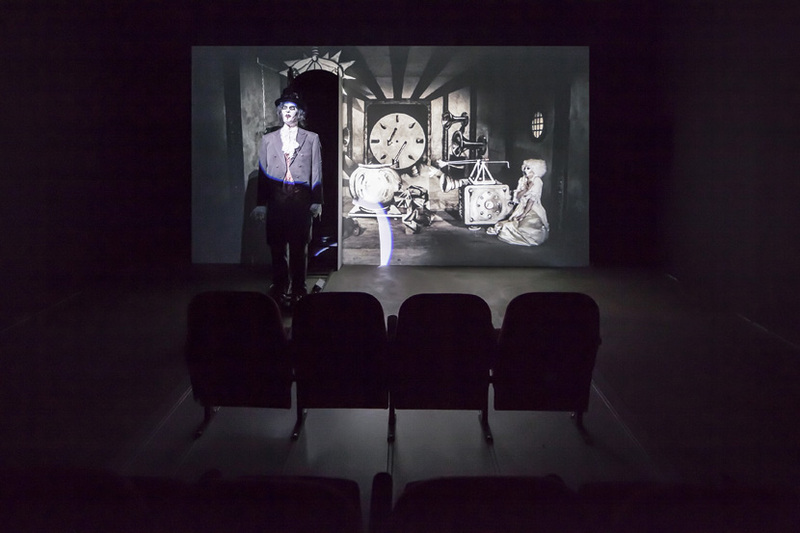 Following Jonathan Crary’s reflection on the development of the moving image against the changing scopic regimes of nineteenth-century visual culture, I want to suggest that Bock’s reappropriation of the conventions of older European popular traditions like shadow and puppet theaters formulates a desire for a repossession of perception. 9 Might it also be symptomatic of a greater longing for re-embodiment in contemporary culture? If one of the functions of cinema was to shift movement previously found in the action of festivalgoers and carnival merrymakers onto the screen and apply it to the image itself, turning previously still photographic images into moving images, then the reincarnation of the film’s main protagonist — perhaps appropriately with a split-personality — also seems to indicate as much. Justin Matherly offers his frieze-like faux-antique monumental sculpture, installed against the living wall, as a cautionary tale about the adverse consequences of foregoing embodied motion. Written not in stone but in cement, the narrative he casts tells of a breach of movement, an interruption of motion, a broken body. Shadow semblances of the original they sparingly reference, they are supported by ambulatory equipment that supports lower limbs rendered immobile by muscular weakness or neurological accident. Whether painted or sculpted, antique friezes are more often than not the visual representations of processions that once proceeded live — like the performances contemporary artists create, the protests activists organize, and the demonstrations citizens stage against threats to their integrity. With its evocative title, Handbook of inner culture for external barbarians (2013) (borrowed from Nietzsche’s On the Advantage and Disadvantage of History for Life), Matherly’s sculpture gives legs to this theory in physical ways and metaphorical terms. The sculpture’s unusual pedestal provides solid, if static, replacement limbs to the protagonists in the stela; 10 might it not forebode the ambulatory future of a culture whose ability to be moved by art — literally speaking, moving along with the display of which it is a part — is in jeopardy? 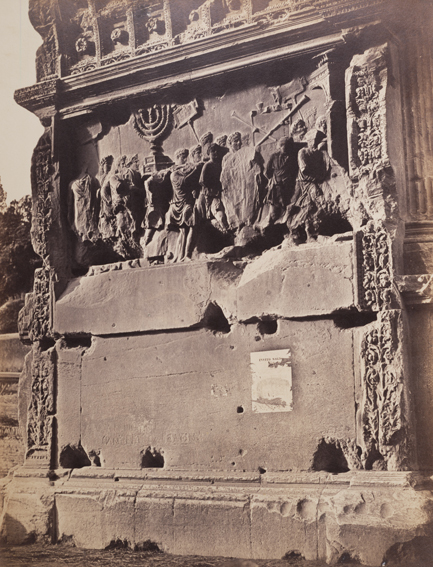 Two works from SFMOMA’s collection bookend this narrative: Robert Macpherson’s photograph Arch of Titus, no. 28, 1909 (ca. 1850) and Wade Guyton’s Untitled Action Sculpture (2008). The former harks back to the glorious past of Roman triumphs, grand processional affairs marked by temporary festival architecture, of which the arch of stones is but the surviving materialization. 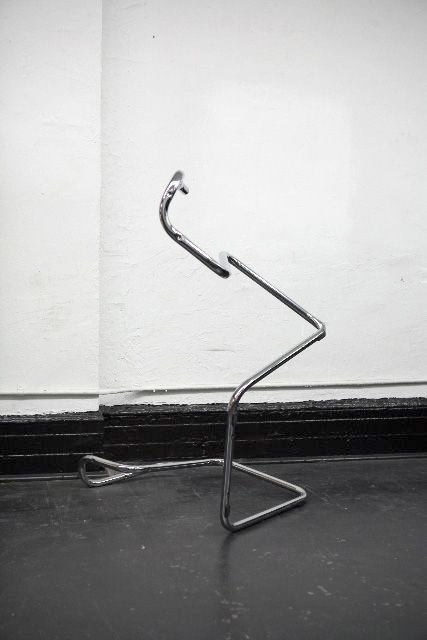 In contrast, Guyton’s distorted metallic chair frame, which rises absurdly into a slender sculpture, alludes in its title to some kind of possible performance contraption. Another ambulatory aid for otherwise immobile (or immobilized) displays and visitors? “We nah beg no friend,” reads the subtitle of Matherly’s work, borrowed from Jamaican dancehall — an unlikely nod to Patterson’s work. Matherly’s work might indeed be a harbinger of things to come. Only if the current dominant art apparatuses develop a cross-cultural appreciation of world history and its attendant multiplicity of display models, presciently harnessed by the artists in Midtopic Mysteries, can museums fully engage just the kind of socially and politically meaningful work they seek to support. Though the most daring artists often go it alone, it’s not so with those in Midtopic Mysteries, whose mainstream recognition in the nonprofit and for-profit art playing field is only rising. The full extent of their work’s intent, however, might be better served by a less contrived curatorial vision than that of the dominant museum model. Ultimately, Midtopic Mysteries throws the ball back not at a generic museum in a vague critical limbo, but straight at SFMOMA as it reopens to an unparalleled array of possible display methodologies, noncanonical art historical genealogies, and expansive forms of public practice. Midtopic Mysteries sets a few of these into imaginary motion — with the hope of sparking actual movement. 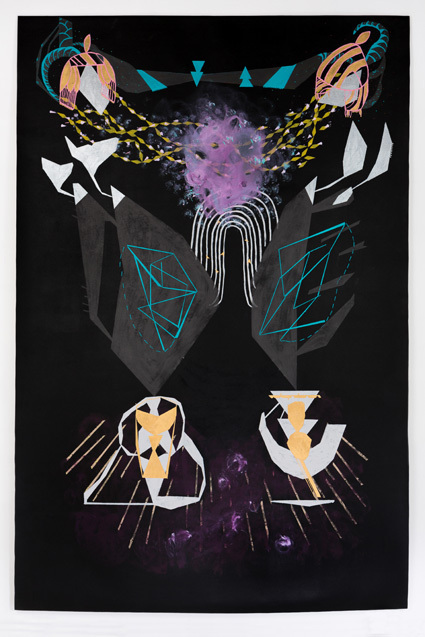 In Out of Easy Reach: 2017–1980, an exhibition proposal by Allison Glenn about contemporary African-American female abstract painters presented at the Independent Curators International (ICI) Curatorial Intensive’s Public Symposium held in New Orleans on March 26, 2016. “[T]his painting seems to invoke the front end of the procession that is ushering ahead of the train and setting a tone for the space.” Caroline Kent, email correspondence with the author, April 3, 2016. Ellen C. Caldwell, “Mental Time Travel with Frohawk Two Feathers,” JSTOR Daily, April 8, 2015, http://daily.jstor.org/mental-time-travel-frohawk-two-feathers/. Ellen C. Caldwell, “Myth, Midtopia, and Mapping: Frohawk Two Feathers and the Making of the Frenglish Empire,” in Frohawk Two Feathers, You Can Fall. Exhibition catalogue for the Visual Arts Center of New Jersey and Ruth and Elmer Wellin Museum of Art. Published August, 2013. https://issuu.com/artcenternj/docs/frohawk_two_feathers_-_you_can_fall/16. The passage is from Tony Bennett, “The Exhibitionary Complex,” in The Birth of the Museum. History, Theory, Politics (London: Routledge, 1995), 59. The original quote reads: “It [Douglas Crimp’s characterization of the museum as a space of confinement] seems to imply that works of art had previously wandered through the streets of Europe like the Ship of Fools in Foucault’s Madness and Civilisation.” I have expressed this view in relationship to the development of contemporary processional performance in works influenced by modern Caribbean festival traditions in Claire Tancons, “Farewell, Farewell, Carnival, Performance and Exhibition in the Circum-Atlantic Economy of the Flesh,” in Claire Tancons and Krista Thompson, eds., EN MAS’: Carnival and Performance Art of the Caribbean (New York: Independent Curators International (ICI) and New Orleans: Contemporary Arts Center New Orleans (CAC), 2015), 26-27. The reappropriation of his Thai heritage by Arunanondchai was allegedly sparked during a studio visit with Rikrit Tiravanija, with whom he has since collaborated. See “A presentation by Korakrit Arunanondchai,” Asia Art Archive in America, October 7, 2013, transcribed by Daisley Kramer, ed. by Jane DeBevoise, http://www.aaa-a.org/programs/a-presentation-by-korakrit-arunanondchai/. Ebony G. Patterson’s Invisible Presence: Bling Memorial was one of nine performances commissioned for EN MAS’: Carnival and Performance Art of the Caribbean, a multi-year, cross-Caribbean touring exhibition and publication project on the intersection between Carnival and contemporary art practice I initiated and curated for Contemporary Arts Center New Orleans and Independent Curators International, New York, in collaboration with Krista Thompson. Patterson’s performance took place in Kingston, Jamaica, while others, including Campbell’s Griffith’s and Locke’s took place in Kingston again; Port-of-Spain, Trinidad, among a handful of Caribbean cities; or London. The Living Need Light, The Dead Need Music (2014) was commissioned to The Propeller Group (Phunam, Matt Lucero, and Tuan Andrew Nguyen) by Prospect.3 New Orleans (artistic director: Franklin Sirmans) and presented at the University of New Orleans’s St. Claude Gallery alongside a display of fantastical instruments conceived by Christopher Myers. Stephen G. Rhodes’s Interregnum Repetition Restoration [should this be replaced with the title used in the body of the text?] was commissioned by Prospect.1 New Orleans (artistic director: Dan Cameron) of which I was the Associate Curator. The installation was presented on one full floor of the Louisiana State Museum’s Old U.S. Mint building. 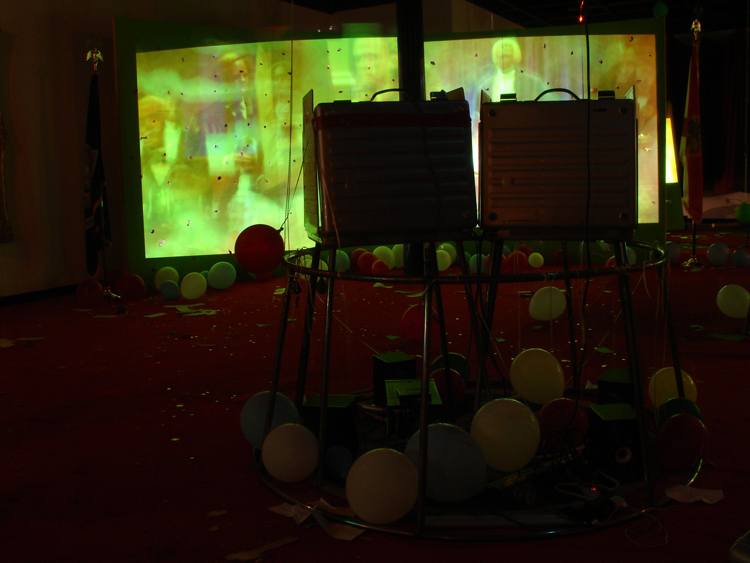 An abridged version was subsequently presented in the New Museum’s The Generational Triennial: Younger than Jesus in 2009. For a long historical perspective on the repercussions of nineteenth-century visual culture onto contemporary culture read Jonathan Crary, Suspensions of Perception: Attention, Spectacle, and Modern Culture (Boston: MIT Press, 2001), specifically Chapter Three: “1888: Illuminations of Disenchantment,” 190-91. See Brienne Walsh, “Industrious Revolution: An Interview with Justin Matherly,” Art in America online, April 8, 2013, http://www.artinamericamagazine.com/news-features/interviews/industrious-revolution-an-interview-with-justin-matherly-/.